If you haven’t heard of Staff Sgt. 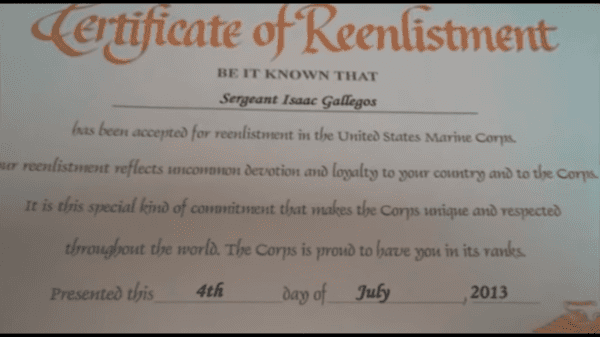 Isaac Gallegos then we ask that you read this and watch his inspirational and amazing comeback story in the video below. There are very few men like Isaac and we thank him, and all service members for the commitment they show to America. Isaac’s story is an example to anyone, anywhere in the world, what is doable if you put your mind to it. His story made the rounds in 2011, then a Sgt., now a Staff Sgt., but it’s worth watching the video if you weren’t aware of him or just want an inspirational kick in the pants. After an improvised explosive device had one Marine burned, broken and at death’s doorstep, the sergeant did what any good Marine would: He battled back. Now he is on the verge of returning to active duty. For Sgt. Isaac Gallegos, a 26-year-old native of Dulce, N.M., returning to his unit, the 3rd Light Armored Reconnaissance, has been on his mind since he stepped on that IED in the Al Anbar Province, Afghanistan, in 2006. Burned over 74 percent of his body, his jaw shattered into 37 pieces and his left ulna broken, Gallegos’ goal seemed almost futile, but his core value of determination stayed strong. But before he can return to his unit, Gallegos has to prove he is fit for duty. After extensive physical therapy where therapists worked to stretch and break up the scar tissue Gallegos got back into training his body. He even scored a 292 on the combat fitness test last December. But for Gallegos the more proof he can offer, the better. So the Marine Corps Trials has become another testament us his readiness. The Trials is a series of athletic competitions held by the Wounded Warrior Regiment, headquartered aboard Quantico, Va., and are designed to build morale where any Marine, veteran Marine or foreign Marine can compete in. This year more than 150 participated at the Trials Feb. 21-26 at Marine Corps Base Camp Pendleton, Calif. The top 50 competitors will compete in the all-service Warrior Games on May 16-22 at Colorado Springs, Colo.
“I knew some guys who were doing it, so I thought it be fun to join in and see how far I’ve progressed as I compete against other guys,” said Gallegos, who competed in the prone shooting competition, the 100- and 200-meter sprint and the 400-meter relay sprint. Even though he didn’t have success earning medals, Gallegos has no regrets about participating in the Trials. Gallegos would definitely do the Trials again in the future as long as it doesn’t interfere with his work at his unit, he said. At the beginning of the Trials he expected to rejoin the 3rd LAR, but during the week’s competition he was cut orders to become a combat instructor at The School of Infantry. Gallegos felt the week was the final proof that he is ready.